John Wiltshire comes to Falésa to be a trader. He learns that the previous traders did not fare well on the island. Johnny Adams for example, died under suspicious circumstances. His successor, Vigours, left the island out of superstitious fear. Wiltshire now meets Case, a rival trader. Case is well-educated, but also very cunning. He suggests that Wiltshire should find a woman and suggests a pretty native girl, Uma. Wiltshire “marries” Uma – he signs a fake certificate of marriage. He is ashamed of this deception, particularly because he comes to care for her deeply. The next morning he awakes to see that the natives have gathered around his house and are staring at him silently. He begins to grow anxious, especially when no one visits his shop. The next day Wiltshire goes to church. He flees, however, when the native priest stops the sermon and points at him. He is now convinced that he is tabooed. He seeks Case’s help, who arranges for him to meet with the island Chiefs. The Chiefs confirm that they are afraid of him and will have nothing to do with him. When Wiltshire relates this news to Uma, she tells him she is the cause of their problems. When she came to Falesa a chief, Ioane, asked her to marry him. The other islanders resented her for his attentions and Ioane retracted his offer of marriage. Since then, all of the islanders have ignored her. Case, however, courted her. Now that she is married to Wiltshire, he is also “banned” from island life. Wiltshire realizes that Case has deliberately put him in this position. Uma offers to leave him so that his life will return to normal, but he loves her too much. When a missionary, Tarleton comes to shore, Wiltshire asks him to legally marry him to Uma. Afterwards, he explains the situation to Tarleton. Tarleton tells him that Case had gained insidious control over the natives through his influence over the priest Namu. Case had also run the rival traders off the island so that he would have no competition. When the trader Underhill was struck with the palsy, Case convinced the natives he was a devil and they buried him alive. He also drove Vigours off the island and poisoned Adams. One day Wiltshire learns that the natives think Case is a “Tiapolo”, a powerful devil. He controls a part of the woods and if anyone goes there, they never return. Realizing that this is all part of Case’s plan to have control over the islanders, Wiltshire vows to reveal him for what he is. One day he goes to Case’s hideaway. Case has put Aeloian harps in the trees to sound like supernatural singing. He has also put up false idols and scarecrows, and painted a face with luminous paint to make it look like the devil. Wiltshire now speaks with a powerful chief, Maea. Maea is angry with Case and trades with Wiltshire for revenge. Wiltshire tells him that Case is a fraud and that if he goes to the place in the woods the next day, he will see for himself. That night, Wiltshire goes to Case’s hideaway and blows it up. Uma follows him and warns him that Case is on the way. Case carries a gun and shoots – Wiltshire falls, breaking his leg and Uma’s shoulder is wounded. Wiltshire hides and then attacks, fatally stabbing Case. Maea and Tarleton arrive, and the natives help Uma and Wiltshire. Afterwards, Wiltshire and Uma do successful business in Falesa. Nevertheless, Wiltshire is pleased when the firm moves him to another station. He and Uma have children and a happy married life, but he is concerned about finding husbands for his half-caste daughters. Keawe is a Hawaiian man visiting San Francisco for the first time. He sees all of the beautiful mansions and wishes that he too could live so well. An elderly man tells him that anything he wishes could be his – he need only buy the magical bottle. The man explains that an imp lives in the bottle. The imp will grant any wish except for prolonging life. However, there is a catch: if the owner does not sell the bottle before he dies, and at a lower prince than he paid for it, he will burn in hell forever. Keawe agrees to buy the bottle and pays the man $50. He now tells his friend Lopaka about the bottle. Lopaka agrees to buy it after Keawe has wished for what he desires. Keawe plans to ask the bottle for a house even more grand than the ones he saw in San Francisco. When he and Lopaka return to Hawaii, Keawe learns his uncle and cousin are dead. As a result, he has inherited their land and a great sum of money. Lopaka suggests that this could be the way that the imp is fulfilling Keawe’s wish. It seems even more likely when the architect Keawe approaches designs exactly the house he imagined. The architect also charges exactly the amount he inherited. The house is built and is perfect. Lopaka, however, thinks this could be a strange coincidence. He tells Keawe to ask the imp to show himself, which will prove to both of them the bottle’s power. When they see the imp, the two men are terrified. Nevertheless, Lopaka buys the bottle and leaves the house. Keawe now lives very happily in his house, “the Bright House”. One day, he sees a beautiful girl and falls in love. 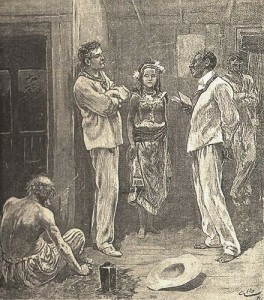 The girl, Kokua, agrees to marry him. He is overjoyed, but finds a blemish on his skin – leprosy. Vowing nothing will come between him and Kokua, he plans to buy the bottle again and wish for health. After some difficulties, he finally finds the bottle. Unfortunately, the price had fallen dramatically – the man who bought it had paid only two cents! Keawe decides he would rather burn in hell for eternity than lose Kokua. He buys the bottle for one cent and is cured of his leprosy. He and Kokua marry but he is haunted by his fate. He finally tells Kokua what he has done and she resolves to help him. They go to Papeete, where the people use French currency. She reasons that they can sell the bottle here for four centimes. When they arrive, people are suspicious of buying the bottle. Kokua decides she loves her husband so much that she will buy it. She asks an elderly man to buy it from Keawe for four centimes (so Keawe will not be suspicious that she is behind it). She immediately buys the bottle from the man for three centimes. Keawe is now elated to be free of the bottle, but cannot understand why Kokua seems so miserable. He later sees her with the bottle and realizes what she has done. He vows to buy the bottle back again. He asks a sailor to buy the bottle from her for two centimes, promising to buy it back from him. Once he buys the bottle, however, the sailor refuses to sell it back. Keawe pleads with him, warning him of the repercussions, but the man doesn’t believe the warnings and says he’s probably going to hell anyway. Now free of the bottle, Keawe and Kokua live happily ever after. Kalamake is a very powerful sorcerer who lives on Molokai. He has a daughter, Lehua, who is married to Keola. Keola wonders how Kalamake always seems to have an endless supply of silver dollars. One day, Kalamake shows him his secret. Using sorcery, he transports the two of them to a strange island. He then tells Keola to bring him leaves from a certain tree. When Keola finds the leaves, he sees a girl. He calls to her, but she flees and does not seem to see him. Kalamake tells him that the magic that brings them to the island makes them invisible to the islanders, although the islanders can hear their voices (which frightens them). Kalamake now sets the leaves in a circle. He tells Keola that he must keep these alight until he returns – when the fire goes out, they will be transported back to Molokai. Kalamake now collects shells from the beach and returns before the fire goes out. The two are returned to Molokai and the shells all become silver dollars. Keola now becomes greedy, and demands Kalamake give him a concertina. Enraged, the sorcerer plans to teach him a lesson. He takes Keola out in a boat and makes himself as big as a giant. He pushes Keola overboard, and tells him he is in the Sea of the Dead. If the water carries him away, his bones will scatter at the bottom and the gods will “devour his spirit” (p. 319). Luckily, Keola is saved by a schooner bound for Honolulu. Realizing Kalamake will kill him if he returns to Molokai, he decides to work on board the ship. One day, they approach an island and Keola swims to shore. At first he is alone, but eventually the islanders return – they only spend a part of the year on the island. They give him a wife and treat him well, but Keola is worried: his wife is the girl he frightened when he went to get the coins with Kalamake. Indeed, on part of the island small flames flare up and go out and strange voices can be heard. The islanders call it “The Isle of Voices”. Keola realizes it is where all of the wizards of the world come to collect their money. He also worries that Kalamake could find him here. He advises the islanders to cut down the trees bearing the magical leaves, telling them this will stop the voices. One night his wife is upset. She tells him the islanders are cannibals and they plan to eat him soon. He goes to the part of the island the wizards visit and not knowing what to do, falls asleep. When he awakes he realizes the islanders have started to chop down the trees bearing magical leaves. The “voices” (the invisible wizards) are attacking them, trying to save the trees. Keola flees, but then hears the voice of his first wife, Lehua. She has used her father’s magic to come to the island and she and Keola now return to Molokai. Both are terrified that Kalamake will return, but he never does. Quotations from Island Nights’ Entertainments, The Works of Robert Louis Stevenson, Swanston edn, vol xvii (London: Chatto and Windus, 1911).